If you are a property manager or owner, we recommend communicating with your tenants early to ensure proper disposal of Christmas trees after the holidays. 1) Start communication with tenants early. Be proactive and send out communication in early to mid-December with instructions for tenants on how to properly dispose of trees after the Holidays and exactly where to place them. Don’t wait until after Christmas to begin telling tenants what to do with their trees. Existing clients, can email or call Bay Area Bin Support for a communication template for your tenants for Tree-cycling instructions. 2) Designate a tree disposal location on the property. Post signs in the common areas and trash enclosures letting tenants know not to dump trees in the dumpster bins. Designate one location on the property where all tenants should drop off their trees. Pick a spot and make sure that everyone knows they should bring their trees out to the designated location by a certain date. 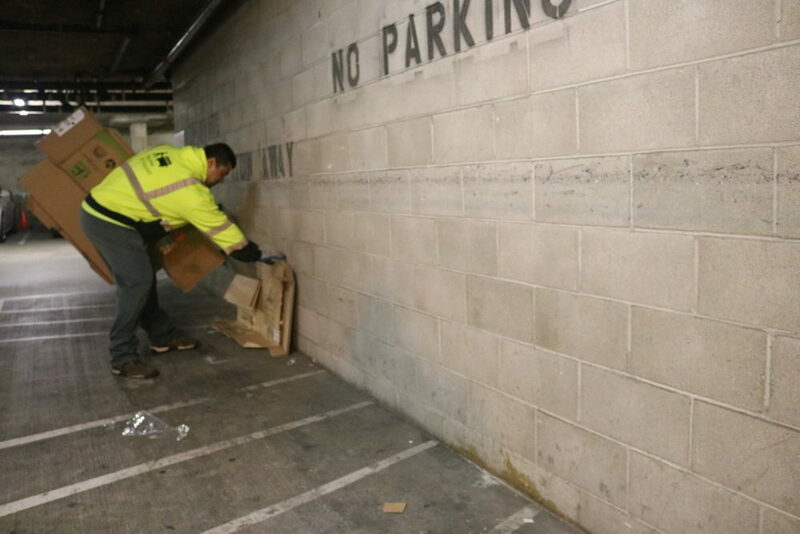 This will help you to avoid expensive overage fees for unwanted items in the dumpster bins or finding trees in random spots around the property. Communicate to tenants or move trees out to curb? Existing clients can email or call Bay Area Bin Support for a communication template for your tenants for Tree-cycling instructions or schedule to have us bring your trees out to the curb for collection. Get in touch today! Most cities collect trees curbside and will provide a collection schedule and instructions on their website. A simple Google search “holiday collection schedule + city” or “city + Christmas tree collection” will usually give you the holiday collection schedule as well as information regarding holiday tree pickups and any other special pickups provided by the city due to the holidays. This way you know the dates that trees will be collected in your city and any special instructions to pass on to tenants including the LAST DAY OF FREE TREE PICKUPS. 4) Give tips on the best way to prepare the tree for pickup. Remind tenants to remove all tinsel, ornaments, nails, and tree stands. Trees should not be placed in bags. Flocked trees (trees with fake snow) cannot be recycled. In some cities, flocked trees may be collected. Make sure to find out how your city handles flocked trees. It is good to remind tenants that whether it is collected by the city or not, a flocked tree will end up in landfill instead of being recycled or composted. 5) Call Bay Area Bin Support to help you! New and existing clients can call 1-888-920-2467 to make arrangements. If the Christmas trees on your property are all in one designated location, our Bay Area Bin Support team will bring the trees out to the curb for collection for you. We want to take this headache off your plate. Call us to make arrangements. In Oakland, CA, a separate collection truck will pick up Christmas trees free of charge until January 18, 2019. Property managers should designate one specific location on the property for tenants to dispose their Christmas trees to avoid trees unexpectedly showing up in different areas of the property including dumpster bins resulting in expensive overage fees. Bay Area Bin Support will bring trees from the designated collection area out to the curb for our clients. Wishing you Happy Holidays from the Bay Area Bin Support team!